Looked at the tides for Monday and it was a slow incoming all day. I knew this was a good tide to fish the Peace River so I decided to make the drive. Launched right at 7:20am yesterday. It was a neg low, but it would be coming in soon and all day. Water temp was 73 degrees, but reached 78 by the afternoon. Water was stained in some areas, but fairly clear in others. Wind was out of the north and blowing pretty steadily in the AM. Later in the day it switched to the NE and that made fishing the river tough, especially the south side. I came out of Whiddon Bay and headed down river to fish every dock I came to. I was probing the docks with the RT Mullet in shadflash color. Lost the first fish I hooked at 7:48am. It was a good snook that spit my lure right at the boat. Not a good way to start, but that was only the beginning of a frustrating, but exhilarating day. Hooked into a pretty good fish under a dock at 8:13am. Turned out to be a nice trout of 20 1/2". As I am going down river, I see bait getting harassed by big fish, probably snook given the water displacement. Small mullet were being slammed into the concrete wall on shore. It was quite a sight. I cast out multiple times on all three occasions, but was not rewarded with a hook-up. I came up to a dock and I see swirls under it and the backs of fish above the water line. Fish were under the far side of the dock. Cast in and retrieved it, but nada. Hopping it back on the next cast and it got crushed. The fish took off, wrapped me around a piling and broke me off. After re-tying, I cast back in. Same result...another break-off. ****! I circled around to the other side. One fish was still visible. Cast in and my lure got nailed. Turned out to be a jack of 17 1/2" to the fork. Feel sure the break-offs were from much bigger brothers of that jack. Finally got a targeted species in the boat at 9:38am. It was a 26" snook caught on the same lure from under a dock. Hooked into another pretty good snook at 9:53am. She was 27". Twelve minutes later I caught a 26 1/2" snook from under a dock. The morning was turning out to be pretty good. Came up on some glass minnows. Cast past and brought it thru. Hooked into a small rat red at 10:14am. Lost an upper 20s snook at 10:40am that just came unbuttoned. After working all the docks, I went to the bridge. It was a dead zone. Not one strike from any fish...not even a dink trout. I went into some backwaters, but it was pretty shallow and kept working the area despite not really feeling it. No luck. Came back out near the docks and began to work them again with a mullet in space guppy color. Proceeded to lose two pretty good snook. One just popped off at the boat and another wrapped me on a dock piling and came off. I must have lost 7-8 fish that came unbuttoned and another 5-6 that broke me off during the day. Some on pilings, but others from breaking the line/leader on the hook-set or during the fight. One knot came undone on me one time. Caught a 16 1/2" trout on the space guppy under a dock at 1:48pm. Got tired of docks on the north side so I went to the south side to work docks over there. This area had paid off for me a few years back, but I am having no luck there now. Also, the wind had switched to the NE now and working the docks was tough. Decided to go back towards the bridge and look for new areas. Didn't really see anything of interest. Knew I had to get over to the north side again to work calmer water. Had some good docks west of 75 that I worked last time so I went there. These docks are prime because it is super shallow all around this area, but there is some decent depth under these docks with a deeper trough just out in front of them. Switched up to the 4" mullet in rootbeer. First few docks and nothing. Around 3:50pm, I skipped my lure under the next one. Reeling along slowly and as soon as the lure cleared the dock, it got blasted. Set the hook and my drag begins screaming. Rather than take me right back under the dock and break me off, the fish heads for deeper water at high speed. Rookie mistake by a big fish. The fish comes up tail-walking away from me. It is a beast. I turn on the tm and follow her. We are pretty far away from the docks now and I can play her. What power this fish had. I loosen my drag. Realizing her mistake she makes multiple surges for the dock, but I am able to prevent her from reaching it. It is a tug of war for about five minutes and this fish put up a great fight with multiple runs and a number of head-shaking half jumps. After circling the boat, I slide the net under her. Half-in and half-out, the net didn't seem big enough. Luckily, the fish kicked and fell head first into the net. WOW! I was in shock at the size/girth of this snook. A woman on the next dock over had seen the fight and apparently she had been trying to catch this fish all day. I quickly went over to her dock to get her to take a pic. After struggling to hold the heavy fish for a pic, I measured her. She came in at 43" and is a npb. Simply amazing! I got her back in the water and held her for a long time. I could feel her getting her strength back and flexing her muscles. Finally, she kicked and swam slowly under the boat and back into the murky waters of the Peace River. What an awesome experience. After that adrenaline rush, I am completely spent and could care less if I catch another fish the rest of the day. Started going back up river with the tm. Working shallow water hoping for some reds, but not happening. Over to the bridge again, but still nobody home. Switched to a spook jr in bone and picked up a rat red near the bank at 5:03pm. Came up on the same docks I had worked two times previously and decided to work them with the rootbeer this time. I lost a few snook and had a couple of break-offs before I landed a nice 31 1/2" snook under a dock at 6:20pm. Normally this fish would be picture-worthy, but it would pale in comparison. The beast in the pic is the star of this report. Getting late so into Whiddon Bay to end the day. First dock...lost snook. A few docks later another snook lost at the boat after a perfect cast into tight quarters under a dock. Had her tailwalking under and out from underneath the dock, but she spit my lure when she jumped right next to the boat. This fish was certainly 30". Wind was a problem so over to a calmer bank to try some topwater to end the day. Using a chugger now. Bloop. Bloop. BAM! A nice snook blasted my lure and up she came. She was a good one too. Another second or two and she sliced my 10# braid. Lost lure. Having no topwater lures tied on, I headed for the ramp. It was mostly a day of lost fish and breakoffs, but one fish made it all worthwhile. Good lord whatta snook. Nice job man. I always enjoy your reports and admire your persistence. A beast of a snook BA. One fish like that and i would have sat back and drank beer for the rest of the day. What size leader do you normally use? Nice fish nice report. You should be a writer! "Insert intelligent sounding quote here"
Thanks guys! When fishing docks I use 20# PP and 40# leader. I must have hooked this fish in a perfect spot cause when I checked the leader it wasn't too badly frayed. A true River Monster!!! Dang. Yeah, 40lb should be plenty I would think. Wow, probably a snook of a lifetime. Nice job landing it and great write up as usual. 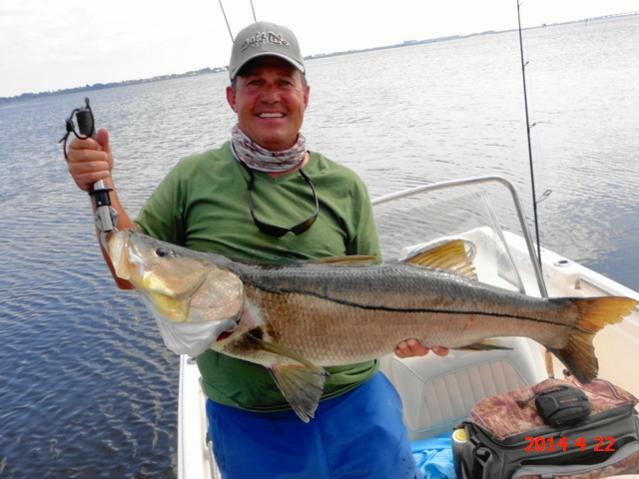 How big was the snook you caught at CRB and pictured in your profile? 40# leader or more is a must under and around docks RM. Trust me on that one. The snook that was in my profile pic was 38 1/2" Ron. A beast in itself, but not in the same league as the one I caught yesterday. Just happy to be a member of the over 40 club. DUUUDDE! Total hoss right there Dave, gotta love the snook situation down south! Excellent Job man, welcome to the 40+ club my friend , whole different animal right there. You deserve it man. Catch 'em and Release 'em! Thanks guys. I checked the bocas as I was pulling her out of the net and she weighed right at 25#s. She was a very healthy and muscular fish. Epic trip there BA , congrats ! Wow Dave...helluva fish buddy. You always have that river fishing dialed in! Thanks Bill. You been doing any fishing in that sweet Ranger? The mojo is back, nice catch Dave. A fish that size off a dock is incredible !!!!!! Thanks BD. Fishing docks is work, but it can be extremely rewarding and so much fun. Yeah Dave I have been trying to get out every weekend for the last month or so. Been mostly fishing out of CRB and heading south. Have done pretty good on some nice size Reds in skinny water over the last month or so. We need to get back out some time! BA, welcome to the 40" club. You've earned it! Good work BA! Impressive as always, but over 40" is better than ever! Congrats man, I know how hard you work at it. The Beatings will continue until moral improves! BEast of a snook man. Nice work. Tarpon... everything else is just bait.